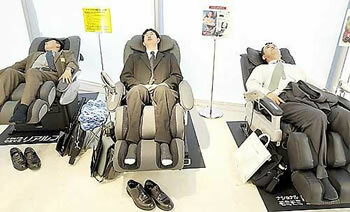 The Sleep Room from Matsushita Electric Works may recieve a welcome yawn from consumers in Japan. Japan is the land of the rising sun - a sun that rises all too soon for weary commuters and hard-working students who burn the midnight oil. A recent Health Ministry survey revealed that 31 percent of Japanese said they didn't get enough sleep. Multiple-hour commutes, stress and long hours robbed grown-ups of the sleep they needed. And students aren't any better off. The weary are invited to a Vitality Diagnostic Corner, where a sleep counselor leads the visitor through a software program designed to create a sleep profile. Once profiled, the prospective sleeper enters the sleep room - about the size of a small hotel room, with a reclining bed with a big TV screen in position. Gentle music, backdrop of natural sounds, room lights dim, the bed reclines fully, the massage starts and - Zzzzz. Is a restful night's sleep worth $30,000? Matsushita is going to find out. See the reference story Sleep room featuring sounds, images, massage opens in Japan for more information.